Alan Henning, a 47-year-old taxi driver from Eccles, was kidnapped in December after crossing into Syria with an aid convoy. Henning's wife, Barbara, had pleaded with the militants not to kill her husband. "He went to Syria to help his Muslim friends deliver much needed aid," she said in a statement released on Sept. 23. Catrin Nye, a BBC reporter who had filmed with Henning, described the Brit as "kind and funny." Friday's video identifies the other hostage as Peter Kassig, a U.S. citizen. It was not immediately clear when the man was kidnapped. Two U.S. officials confirmed to the Associated Press that Kassig is being held by Islamic State militants. CNN described CNN described Kassig in 2012 as a former U.S. soldier turned aid worker, who helped wounded Syrians at a hospital in Lebanon. According to a 2013 Time magazine report, Kassig later started his own aid group in Syria and Lebanon, called Special Emergency Response and Assistance. At the time, SERA focused on providing refugees with medical and other supplies. In a statement issued later Friday, British Prime Minister David Cameron said of Henning's killing, "The fact that he was taken hostage when trying to help others and now murdered demonstrates that there are no limits to the depravity of these ... terrorists." 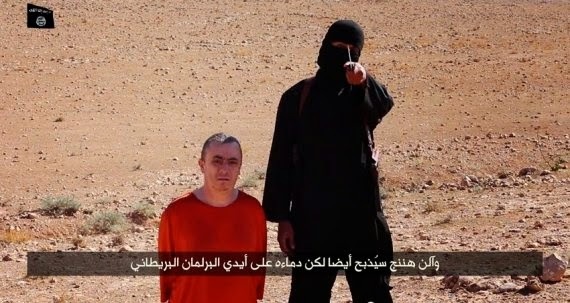 U.S. President Barack Obama condemned the "brutal murder," saying "Standing together with our UK friends and allies, we will work to bring the perpetrators of Alan's murder -- as well as the murders of Jim Foley, Steven Sotloff and David Haines -- to justice," and, "we will continue taking decisive action to degrade and ultimately destroy ISIL."